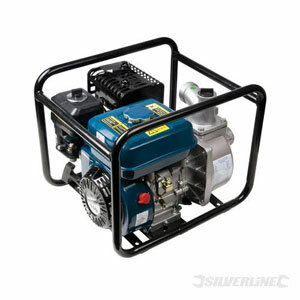 Powerful 6.5hp motor with strong metal carrying frame. Complete with hose connections and filter. Ideal for draining pools, pits, trenches and foundations as well as irrigation applications. 600Ltr/min maximum flow rate. 32m pumping elevation. 8m suction head. Accepts floating solids to maximum 5mm dia. 14 hour continuous run time (Max). 3.6Ltr fuel tank.